Unused drugs are a potential source of supply for illegal consumption and pose an unacceptable risk to public health and safety. In collaboration with the Drug Enforcement Administration (DEA), North Central Behavioral Health Systems and the Illinois Department of Human Services Substance Abuse Prevention Program are hosting a National Prescription Drug Take Back Day on Saturday April 27th, 2019, in an effort to bring national focus to the issue of pharmaceutical controlled substance abuse. According to the 2015 National Survey on Drug Use and Health, 6.4 million Americans abused controlled prescription drugs. The study shows that a majority of abused prescription drugs were obtained from family and friends, often from the home medicine cabinet. 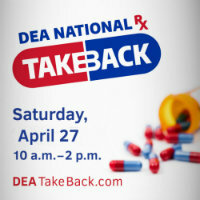 The DEA's Take-Back Day events provide an opportunity for Americans to prevent drug addiction and overdose deaths. In partnership with Hyvee in Peru, individuals can safely discard their left over prescription drugs at Hyvee Pharmacy on Saturday April 27th, from 10:00 am to 2:00 pm. In addition, the following are drug take back locations in LaSalle, Fulton & McDonough Counties. Please note all of these locations can accept left over prescription drugs at any time, not specifically limited to the April 27th date. 1651 Midtown Rd. 1503 4th St.
128 W Walnut St. 301 W Lafayette St.
For more information and questions about National Prescription Drug Take Back Day please go to https://takebackday.dea.gov/ or call the DEA’s registration call center @ 1-800-882-9539. “Funded in whole or in part by the Illinois Department of Human Services, Division of Substance Use Prevention and Recovery through a grant from the Substance Abuse and Mental Health Services Administration.